← What Has St George Got to do with Leadership? Do you rely on one or two people to get the work completed on time and up to standards? Or does everyone contribute towards the goals of the team? How are targets set? Are they top-down, or bottom up? Is there a robust discussion about past performance and future goals? High performing people are passionate about their work and want to confront the issues that are preventing development and success. Are you confronted by your team about performance? How open are the team about shortcomings? Does your team feel supported? Is there trust within the group and with the manager? Are the five pillars of trust present and what areas of development are needed? This seems a contradiction, however high performing teams have high levels of both. Most people only think of conflict as destructive, but conflict can be highly creative when channelled in the correct ways and times. Are your processes and procedures appropriate and help individuals and teams succeed, or do they get in the way of performance? How do you know? We lead people appropriately when the two dimensions of leadership are considered: The Competency and Commitment of the team. Most teams perform moderately due to the lack of appropriate leadership. Use a range of leadership approaches to get the very best from your team. How often do you review team performance as a team? High performers do this regularly and frequently too. Not having the time to review performance is just an excuse that mediocre managers use to cover for poor performance. Teams are only as good as the individuals within them. Managing this talent requires commitment and resources of time and money. Great leaders always have time to develop people. Managing relationships within the team can be complex and feel unrewarding. Managers feel under pressure to focus on the work and many consider personal relationship “issues” a personal and private matter. This can be a fatal error regarding team performance. Our relationships at work are vital to our success. Beyond the numbers, it is the quality of our relationships that count. What is “good” communications? How will you know when communication is or isn’t working? How can we measure communication in a team? These are great questions and they can be answered through regular testing and measuring the right areas. Getting great teamwork is an on-going process. 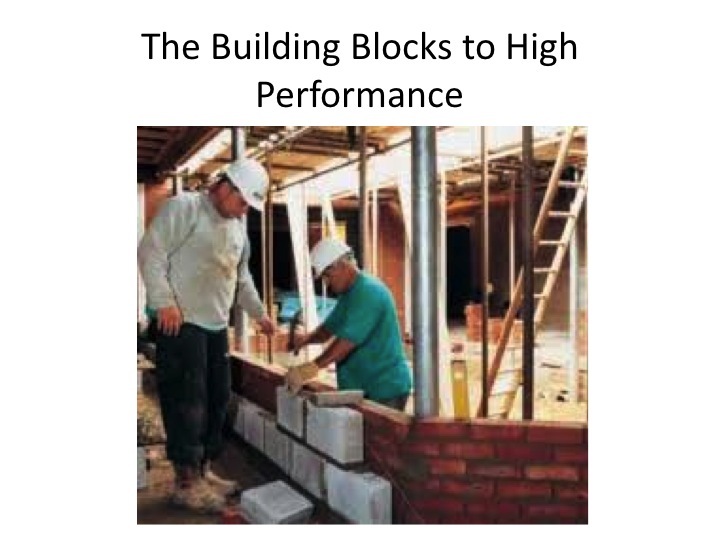 These building blocks will give you a great start. This entry was posted in Communication, Leadership, Performance Management and tagged communication, customer service, leadership, motivation, productivity, Teamwork. Bookmark the permalink.